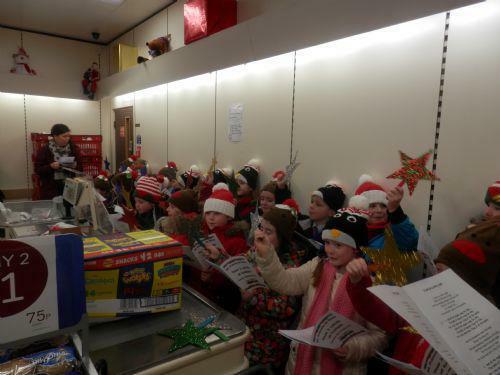 On our trip to Iceland we sung Christmas carols in front of lots of mums and dads, Iceland workers and Iceland customers. We wanted to spread Christmas cheer and make the people in our community happy. We were also collecting money for guide dogs, we raised £50! At first some of us were very nervous but in the end it was fantastic. One of our favourite carols to sing was Twelve Days of Christmas because of all of the funny actions we did. We all wore soft, woolly Christmas hats shaped like Santa, Rudolph, Christmas puddings, elves and penguins. We loved singing carols for people so much that we sung them all the way back to school!